The standard route up Denali is via the West Buttress, first ascended by Bradford Washburn in 1951. The West Rib was as yet unclimbed and promised to be a more technical climb than the West Buttress route. 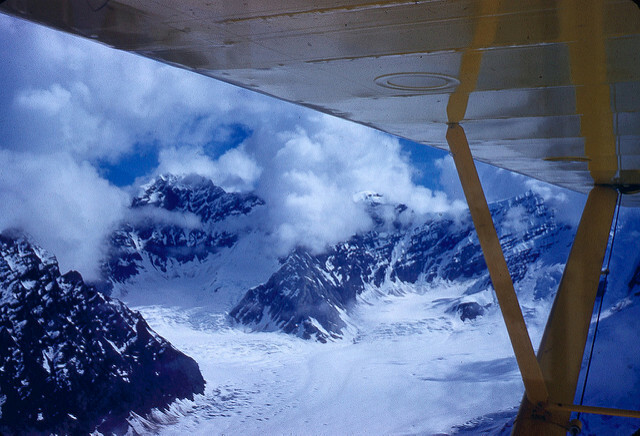 In June of 1959 the expedition team arrived in Alaska and reached the foot of Denali by plane. The team was led by Jake Breitenbach and composed of three others: Barry Corbet, Pete Sinclair and William Buckingham. 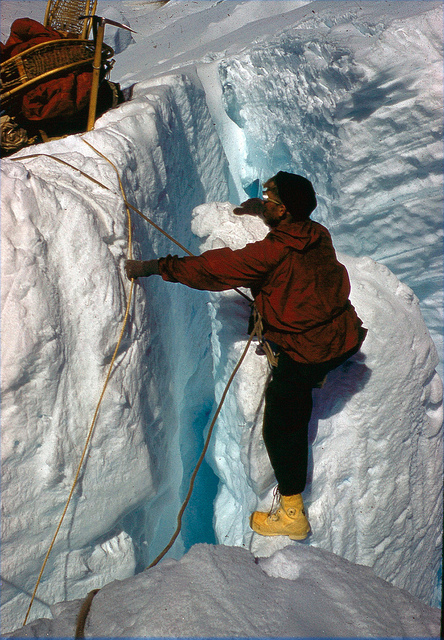 The average age of the expedition members was just 23-years-old, making it one of the youngest expeditions to attempt such a climb at that time. 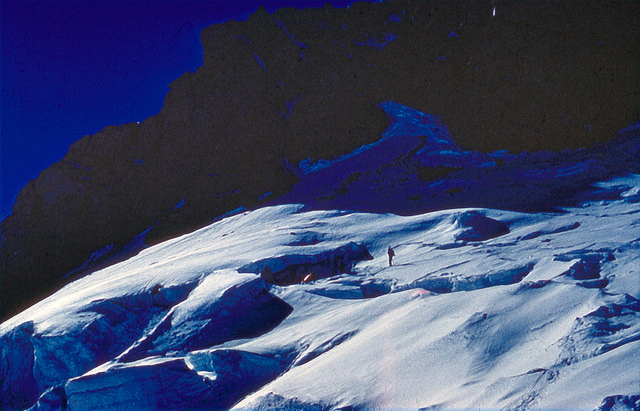 Intermediate Camp, three miles up the glacier. Threading our way from Base Camp to Intermediate Camp. 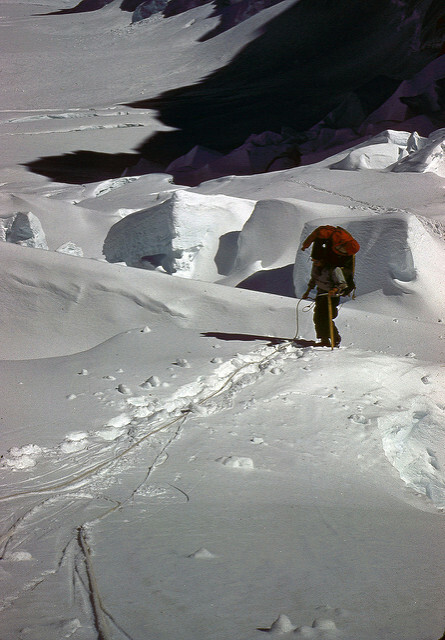 Bill Buckingham finding a route from Intermediate Camp to Base Camp. Carrying loads from Intermediate Camp to Base Camp. Climbing through the Rock Ridge. Day two was spent relaying loads of supplies to Base Camp, situated near the icefall at about 9600 feet. That night, a great deal of food and about 1700 feet of rope were airdropped in, landing a few yards away from the tents. Day three saw Barry and William trying to find a way through the icefall. They noticed that a thin blade of ice descending about 15 feet on the near side of the crevasse, coming close to the far side. 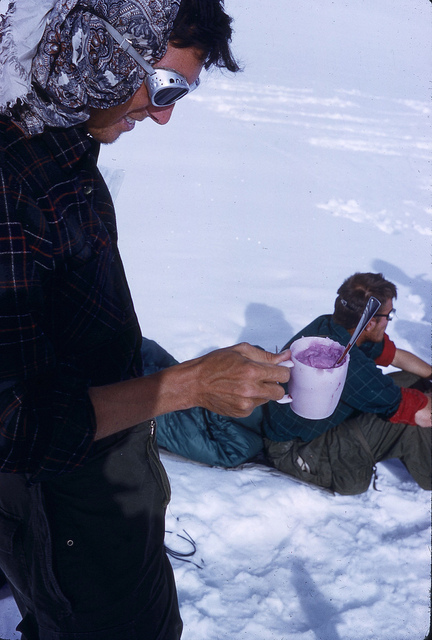 Barry and William changed their snowshoes for crampons and made their way across the icefall to the North side of the glacier, where they set up camp at a small bergschrund at the base of a rock buttress. They named it Icefall Camp and returned to Base Camp for the night, to set out for Icefall Camp with more supplies and the rest of the team the next day. Off came out packs and snowshoes, and soon Bill was cutting his way down into the crevasse. Ten feet down, and he was gingerly dancing across a six inch vane of ice to the wedge. Another ten feet of vertical climbing on rotten ice and he hauled himself onto the flat top of the wedge. We crossed a few more crevasses on somewhat doubtful bridges, veered to the right under the hanging glaciers of the Kahiltna Horns, and put our snowshoes back on for the more amenable crevasses leading to the base of the Rock Ridge. Crossing one of many crevasses en route to Icefall Camp. Camp far below in the icefall. Finding a way through the icefall. Jake in front of one of hundreds of crevasses in the Icefall. The next morning, after bringing more gear to Icefall Camp and pausing for lunch, Jake and Pete went to scout a route up the buttress. They found that the route up that way was blocked by a gendarme (a rock pinnacle blocking access to an areté) and the only possible route remaining was a traverse to the east into a steep snow gully. The gully turned out to be mostly ice, covered by a half inch of snow. After several hours of chipping steps into the ice and placing about 800 feet of fixed rope, the group was still only about halfway up the gully. The following day was spent relaying loads of supplies to the base of the gully and beginning the route up the fixed ropes with gear. It took placing an additional 800 feet of fixed rope before they arrived at the tip of the gully, the crest of the buttress. 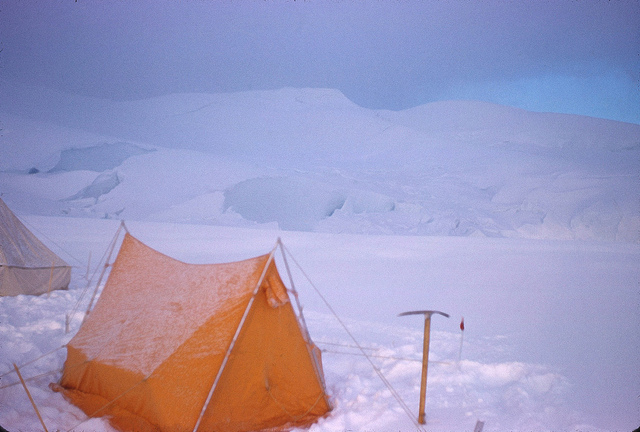 After relaying supplies to the top, they were able to chop a platform in the ice barely big enough for a tent. In an hour, we had picked our way over a number of rotten snow bridges to what we thought was our couloir, rejected it as being too steep, and returned for lack of anything better. We belayed and fixed our ropes to rock pitons on the southern wall. The couloir had an uncanny ability to trick us into thinking that the ice was about to turn to snow. With 800 feet of fixed rope already in place and only half of the gully ours, we felt that retreat was in order and arm rappelled down to a 10:30pm supper. Jake in Col getting a rather late start the next morning, we all carried loads to the top of the fixed ropes. Relentless, it continued as it had the night before- steep hard ice. Another 800 feet of fixed rope went in. Then, joyful moment! We stood on the ridge crest again, gazing down at the ridge we had circumvented. I shuddered as I thought again of carrying loads up the ridge. No, the ice gully was the right way. Buck, Jake, and Pete heading to fix ropes in the couloir. Pete climbing the fixed rope carrying a load of gear. In the morning, the team found that the ridge above rose in two great white domes or bumps before leveling off onto a narrow plateau. The only possible route was a direct ascent of the second of the bumps, which was steep and glassy ice. To ascend this way, they would have to retrieve some of the fixed rope they’d placed in the gully and place it along nearly the entire route up the ice bump. The two bumps ended up requiring a total of 1700 feet of fixed rope to make it possible to ascend. At the top of the bumps was a broad ridge that was nearly level for most of its length until it gradually became a steeper rock face. 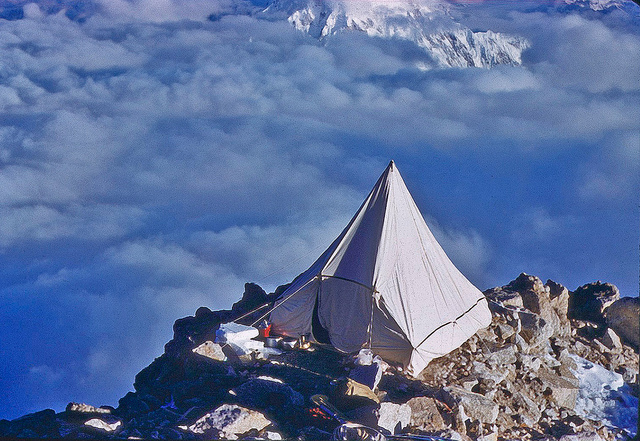 They set up a luxurious 2-tent camp at the base of that steeper portion at 13,900 feet and named it Camp Paradise. On the rope looking for a route over the Bumps. It seemed that our hopes were to be dashed by these insignificant little excrescences on the ridge crest. Cutting steps on the Second Bump. We were soon over the saddle and cutting our way up the Second Bump, where we were able to avoid the steep lower section on its west side. After two rope lengths on this Bump, threatening weather and the knowledge that the route was possible turned us back. By June 16th they’d made their way to 14,800 feet. Though the route was somewhat less difficult, the altitude had an effect and their camp for that night was dubbed Camp Fatigue. The following morning brought a change in the weather and the team knew they’d only get a few more days of decent weather to work with. The plan was to split the gear into eight loads and make two treks up the areté to the West Buttress where they would see if it was possible to traverse. They would leave the first loads there, return for the second half and then make a stripped down camp as high as possible in order to attempt a summit assault on the 19th. All went according to plan the next day and by late afternoon the team had reached the base of a 250 foot rock bastion at about 16,500 feet. There they camped on a “little jutting promontory of rock” which only required a little remodeling to make it possible to pitch a tent. This they named Balcony Camp. Previewing the route from camp. Pete and Buck preparing for the summit in Balcony Camp. Near the tent high up in Balcony Camp. Another picture of Balcony Camp. After rising early, the team made their way up the first steep walls to about 18,000 feet, where they found they were on a wide and shallow couloir which rose steeply upwards. Buck and Pete nearing the summit. Breaking onto the summit plateau. 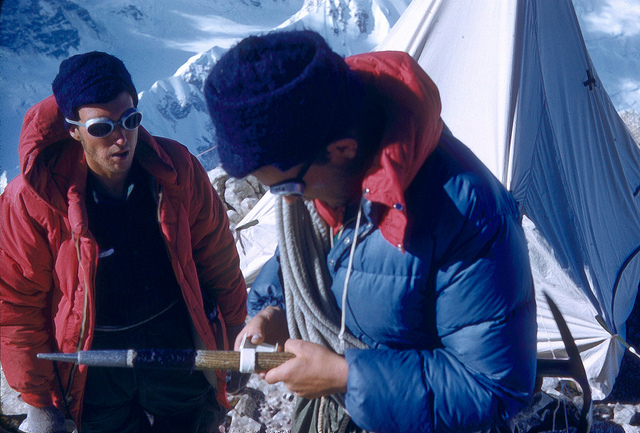 Barry Corbet on the summit of McKinley. June 19, 1959 Jake and Pete on the summit of Mt. McKinley. Above us, great cumulus caps reared up to 25,000 feet; below, the clouds were at the 18,000 foot level. At the summit we took a few pictures, spoke some garbled nonsense into the tape recorder we had brought with us, and rested ourselves for the journey down. When they woke on the morning of June 20th, nearly 2 feet of fresh snow had accumulated at Balcony Camp and it was still falling. The team took the hint and began their descent. The accumulation of snow had changed the landscape and obscured landmarks, causing an anxious time trying to find caches of supplies and food they’d left for themselves on the way down. While visibility was low because of the storm, they were able to make their way down the West face without falling into a crevasse. Before long they’d joined up with the West Buttress Route and reached Windy Corner at 13,200 feet with only one minor crevasse-related incident. 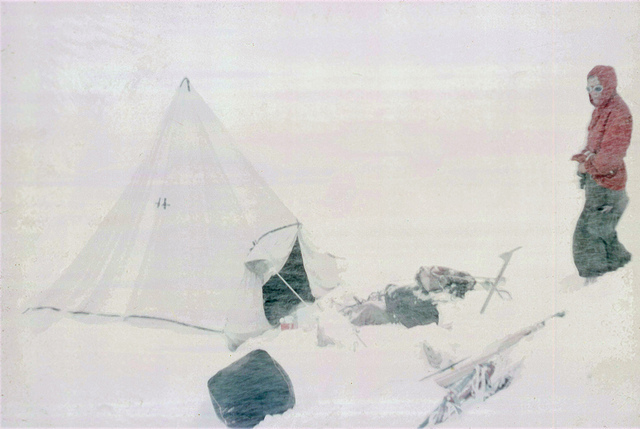 They camped for the night at Windy Corner and in the morning aimed themselves downward in whiteout conditions. 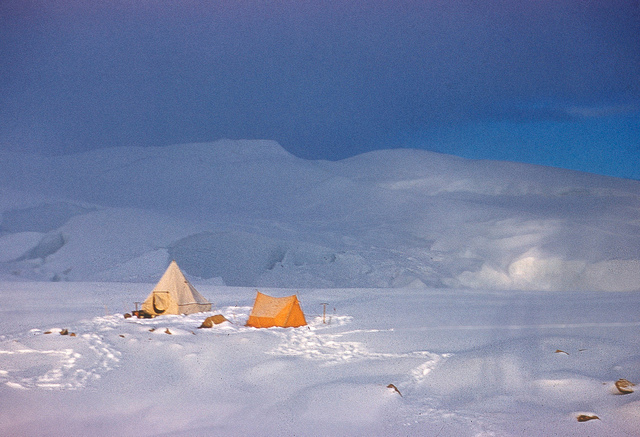 We fell into the Logan tent at 10:30PM, cooked a light supper, and slept until noon the following day. When we awoke, it was clear that our long awaited storm had arrived. Glacier Camp after summiting Mt. McKinley, with traces of fresh snow. The Logan tent during a snowstorm. Below Balcony Camp, we found the rocks deeply buried, by not unduly difficult. Visibility was about seventy feet. Once past the sharp snow ridge, we started looking for the ice axe marking our cache. We remembered only one ridge with a single crest from the ascent. Now there were three or four separate crests. Jake and I went to look for the cache again, leaving our packs behind. Picking our way down the western edge of the ridge, we had a warm sensation of familiarity. A moment later, we both saw it. Of all our cache, the only part visible was four inches of ice axe. They spent the next few days camped there until, on June 27th, they could hear the unmistakable sound of an approaching airplane. Sheldon had arrived to collect them and their new route was a success! For this post we used William Buckimgham’s American Alpine Journal report pretty heavily. It’s a great first-hand account and a fun read. You can find it here. The photos included in this post are from the library’s Barry Corbet Collection. Check out more on Flickr.